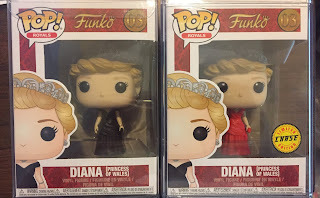 The upcoming royal wedding of Prince Harry and Meghan Markle is less than 24 hours away and in a cool coincidence some Funko Pops featuring Princess Diana I ordered from CNS Toys arrived today. I am just old enough to remember when Princess Diana was still alive and how much we all loved her. I also remember that fateful night she sadly died in a limo crash whilst the driver was trying to evade the paparazzi. Having Funko Pops commeerating Princess Di is really neat, even if the Funko corporation maybe should have thought-through the questionable messaging of having their rarer variant labeled a, "Chase," seeing as how she passed. That aside, it is a really cool Funko Pop and I love the rarer red dress variant even more--hence it going in a hard-stack to keep it extra safe. Thanks again to CNS Toys, and I want to remind readers of the blog that if they visit CNS Toys and make a purchase, they can use promo code TNR5 for 5% off. I appreciate CNS Toys giving me such a code to share with folk and hope it can assist other Funko-fans in getting their desired items!